Throughout this process, we have felt the need to connect more with our community partner in order to make our work meaningful. One of our most significant activities that helped us to feel more connected and grounded in the work was the participation in the DTES NH Volunteer Orientation. During the orientation, staff recounted a deeper history of the DTES NH than we previously had learned in this project and they placed it within broader historical movements, such as social work. We were also given more detailed descriptions of their programs and how they specifically address issues within the neighbourhood. Beyond the safety protocol and health regulations, we also learned about the code of conduct. This went beyond a typical code of conduct one would expect in the workplace. For example, we were told to refrain from speaking about our religious beliefs in front of clients because some of them may have past trauma linked to religious institutions. They offered ‘rules’ that helped us navigate respectfully, that we would have otherwise been blind to, given our privilege. There was also a discussion of the welfare system in British Columbia, and how it affects the lives, the schedules, the eating habits, and the health of residents. We became informed of just how much the DTES NH’s programs must shape themselves around the welfare system’s structure. During the orientation we were also given difficult scenarios to work through that may come up as volunteers at the DTES NH. This aspect of the volunteer orientation was memorable because it challenged us in new ways, using scenarios we may not have been prepared for, due to our inexperience with the community. The DTES NH volunteer orientation was significant to our group because, midway through our project, it reminded us of our original goals and helped us to meaningfully connect this project to larger issues. For many of us, the orientation was an experience to see community action and resilience within a real-world environment. While each of us in the group has theoretical experience with topics such as British Columbia’s welfare system, privilege, residential schools, food justice, etc., it is otherwise difficult from the comfort of a campus lecture hall to see the real-life effects of social issues and the way communities are addressing them. While some of us have been lucky to connect our theoretical knowledge in real-life contexts, it was new for all of us to understand them in the Downtown Eastside. Additionally, the breakout group scenario exercises illustrated to us the depth of knowledge we have yet to gain about the DTES community, and how we have merely scraped the surface with this project. Once we shared how we would react to these scenarios, staff offered their feedback. It was during this point that we realized that our instinctual responses to issues we have experienced in our lives previously may be harmful in the context of the Neighbourhood House. At that point, it became obvious to us that we had not learned everything there was to know about that special place and the people who live there. This experience was also significant in terms of connections to the bigger picture. When the volunteer coordinator was explaining the programming at the DTES NH, he made the strong point that they only provide programming that the community has asked for. He went on to explain that they provide a physical space and as many resources they can, but that the programming must be requested and controlled by the community. It was exciting for us to connect a keystone theme of this course, Asset-Based Community Development (ABCD), to our community experience. In addition to theories discussed in LFS 350, this orientation drew connections to larger conversations happening in Canada’s political realm. The volunteer coordinator’s discussion focused on the financial realities of DTES residents and the welfare system implicitly spoke to universal income discourses happening in Provincial Legislatures, newsrooms, and kitchen tables across our country. It was important for us to see how this larger debate was relevant in our very lives. As we wrap up the course and our project this week, we can reflect on our learning from our direct experiences with the DTES NH. Attending the volunteer orientation session brought a depth of understanding to our group that we hadn’t yet gained in our project work or our previous volunteer sessions, and allowed us to put the remainder of our work and our finished product in a context that we hope will be more useful to the DTES NH. We have a greater understanding of how our work will fit in with the DTES NH operations, and we hope that we have produced it in a thoughtful and respectful manner that aligns with their values. If we hadn’t had this opportunity to learn and contextualize, we may have unintentionally disconnected ourselves further from the DTES NH, as all of our work was external to them. If this had been the case, we probably would not have produced useful or meaningful deliverables to them. Although we did not complete all of our objectives, spending time doing activities like this was very important. Each of us felt much more invested and knowledgeable about the work after attending the orientation and volunteering at various sessions, and felt a renewed inspiration in the work. In addition to giving our work a deeper context, it shaped us as more conscious students. 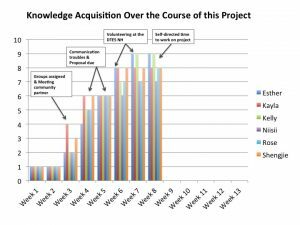 It made us understand that, although not every hour spent on a project will necessarily directly link to our project outcomes, or directly translate into grades, or pay in our careers, but it is all just as important to the overall project. However, it also made us understand that we still have so much more to learn. As we leave this course, and continue with our academic paths or enter our professional careers, some of us will continue to live and work in Vancouver, and we now have a greater connection to and understanding of this community. Some of us may continue to volunteer with the DTES NH, but even if we do not, we will still all carry a new way of looking at a marginalized communities, new skills to respectfully and meaningfully work with these communities, as well as an appetite to learn more. We have just barely touched the surface in this limited timeline project, but this was the start of an ongoing learning experience which has given us new ways to examine the world around us. TEAM 1: Keep contacting with BIAs, and research year-round markets and holiday markets in the Vancouver area (Christmas Markets located near the Science World and Queen Elizabeth Park). TEAM 2: Research information of the sustainability, production, and origin, interesting facts, and other selling points of each product included in the basket by interviewing community partner or online researching. TEAM 1: Obtain information from the two Christmas Markets about what conditions are needed to get a table during this year’s selling season and if they provide any advantages for non-profit to get in. WHOLE GROUP: Provide the DTES with clear and straight-forward findings from our work. WHOLE GROUP: Compile a holistic document that can be used as a “road-map” for selling the year-round products and holiday gift baskets in the next 12 months. During last week’s tutorial, we did some exercises that helped us to reflect on our project up until now. Specifically, we looked at the knowledge and skills we felt we have gained so far, as well as our emotions towards the project. We like to think that our group has been communicating well, so our teammates’ feelings did not come as much of a surprise to us. 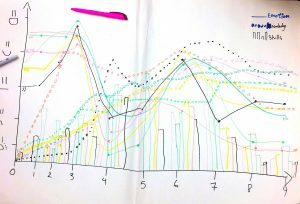 We were asked to plot our emotions, our knowledge acquisition, and our skills acquisition. Do not worry! We have taken this data and made it into easier-to-read graphs below! For most members of the group, this has been the most difficult part of the project emotionally. However, it was a tremendous source of learning too. We found it to be a great exercise in practicing professional and effective communication. It also gave us insight into the realities and inner-workings of non-profits. Creating the proposal without all the necessary information, we found ourselves deep in the dark forest of uncertainty. We leaned on and supported each other during this time, and maintained great communication amongst ourselves which taught us about teamwork. During this time, we found ourselves tapping into our creativity and improvisational skills. In the end, we learned a lot about the value of face-to-face communication. Volunteering at the Neighbourhood house gave us first-hand experience with the DTES community and some of its residents. Many of us found it to be an informative experience because we got to see the real people behind the concepts we learned at the learning exchange. During the volunteer orientation, we gained deeper insight into the DTES Neighbourhood House and its mission, history, goals and impact. We acquired skills related to professional and appropriate interaction with the patrons, which we find to be an important skill to have for this project. As you can see from this graph, this project has had a significant impact on us, and we all feel quite emotionally invested in it. In the graph, we have highlighted important moments of this project that have been meaningful for us. We have decided to elaborate on them more below. This was a high point for many of us. We were very excited about this opportunity for various personal reasons. For example, Niisii was excited about this project because of the opportunity to connect with the Downtown Eastside’s community, including the large urban Indigenous community, and learn about a different part of the city we are calling home. Overall, this was the “low point” of the process. We encountered some barriers to communicating with our community partner which impeded our ability to complete our research proposal assignment within an acceptable timeline. We feel that momentum was lost at this point, and we believe the project has had trouble recovering from it. Many of us found it difficult to “bounce back” after the proposal stage, but we all felt quite reinvigorated by having the chance to volunteer at the Neighbourhood House. It was incredibly meaningful to meet the patrons who benefit from the services at the DTES NH, and it re-motivated us to some degree. Now that midterm season is upon us, many of us have not had the time to meaningfully engage in the project as much as we would like to, and there has been little time to volunteer at the DTES NH. For this reason, the motivation that volunteering provided us is starting to fade. Coupled with flu season, we are finding it difficult to keep up our momentum that we had before the proposal. Our relationship with the DTES NH through this project is really more of a first phase, in that there will be a new group working with the DTES NH the following semester. So, in some ways, we are looking at the end of this project as less of a “graceful dismount”, but hopefully more of a “graceful transition”, a passing of the baton so to speak, to next semester’s group. In terms of a graceful transition, we will have hopefully laid much of the groundwork for the incoming group. We will have had conversations about developing working relationships with the three BIA’s in the DTES, hopefully leaving helpful groundwork for the DTES NH to continue working with them. We will have also had conversations with the community organizations that the Neighbourhood House suggested we get in touch with. Since we are working in an email overload environment, we have had to make some quick adjustments to connect with these organizations. For example, we did not receive a reply from the three BIA’s via email, so half of our group went to their offices to talk to them about the DTES NH and our project with them in person. We found that this was a more effective way to achieve our goal. During each interview, we recorded questions the BIAs had that we could not answer, and will continue to be in contact with our community partner to clarify the information we need during the project at each step. The initial connection is really important, as it is possible that before that point, the various organizations were unaware of the DTES NH, who they are, what their aims are, and the invaluable service they provide to the residents of the Downtown Eastside. We realize that building and cementing relationships take time, so trying to further develop these relationships in a professional and positive manner will be key for a graceful transition. Additionally, laying the groundwork by researching the numerous Farmer’s Markets around the Vancouver area is an important end product of our project, and will be important for a smooth transition. Once the research has been completed, it is possible that the new LFS 350 team could support the DTES NH in entering some of these markets, which would be a great option for establishing some sort of routine, and ideally a fairly consistent source of profit which can be used to further their various projects and initiatives. As we are coming up to the end of the project and we have two teams working on different tasks simultaneously, it is becoming increasingly important to share the progress between teams. This will happen primarily by meeting more frequently to ensure that everyone is well-informed so we are aware of our teams progress because we want to be able to achieve the goals we set out for ourselves, and for the DTES NH. Throughout the final weeks of the project and the semester, it will also be important to check in that each member is still participating and involved so that we all have an equal opportunity to learn and grow through their participation in this project. Attached we have a copy of our Project Proposal. WHOLE GROUP: Get a better understanding and make connections with the organization and communities accessing their services. TEAM 1: Research the three local Business Improvement Areas (Hastings Crossing, Strathcona, and Chinatown). TEAM 1: Obtain information about location, contact info of the three BIAs and identify what kind of help and service that they can provide for DTES NH. TEAM 2: Obtain information about location, contact info of three organizations that may buy or help distribute products of DTES NH. TEAM 1: Contact the three BIAs by appointment, email or phone. TEAM 2: Contact the three focus community organizations above by appointment, email or phone. TEAM 1: Help build partnerships between DTES NH and BIAs; obtain advice, feedbacks and the resources that they can provide to DTES NH for future development. TEAM 2: Obtain feedback from the three focus community organizations, provide a report to DTES NH about who can distribute their products (year round baskets) in future. Initially, we felt some confusion regarding our purpose and objectives for our project. This was mainly due to challenges in communicating effectively with our community partner, and, consequently, feeling unsure about what the DTES NH felt was their biggest priority for the project. Eventually, we were able to somewhat surmount this hurdle by attempting a new means of communicating with our community partner, but we were still somewhat unsure as to which objectives would best fit the DTES NH’s wishes, and this road bump left us a little bit behind schedule. We decided to talk to our professor and our TA regarding these issues, as we were concerned about our ability to complete our proposal within the given timeline, considering the lack of clear objectives. During Wednesday’s tutorial, each group presented their proposal, and our group felt unprepared since we were still unclear of our goals. Considering this, we weren’t able to successfully present our thoughts, had too many objectives and did not manage to highlight all the main points during the presentation. After the tutorial, our group talked again with our TA to get some advice on what steps to take to be more successful. This conversation was very helpful, he shared some of his views and suggestion in terms of what we could do to improve our communication. From our initial volunteer time slot at the DTES NH, we were able to have face-to-face conversations with DTES NH staff. This helped us clarify communication points of contact, as well as schedule the second meeting with the current and interim Executive Directors. This made us feel more relieved because it gave us a chance to gather all together before the upcoming shuffle betweem Executive Directors,, which was a point of worry for our group, as they are our main contact. In this meeting, we were able to share our thoughts on what we felt were reasonable objectives, given the time frame and our expertise, clarify our shared objectives and priorities , and through honest, open communication between the DTES NH and ourselves, we were able to decide the best and most realistic methods to achieve this. Eventually, we agreed to create a roadmap-type document to guide their product marketing and planning in the upcoming year, as our tangible ‘product’ at the end of the project. The roadmap will be helpful for us, for the DTES NH to understanding our learning process, and also for the next group of LFS 350 students who will be working with them in January. This meeting was also great because we were able to see the products of the Holiday basket, some of which will be apart of their year-round basket. After the conversation with our partners, we felt like we had reached a place where we could comfortably move forward with the project knowing that we were now on the same page as our community partner about the project and expectationse. It was very evident that they were happy to be apart of the project and have some extra hands and heads to support them. They also reiterated their willingness to communicate over the phone, as a means of quick and accessible communication, in addition to email. They have been very clear that they want to support our learning and ensure that while this project will help them, we also take away a meaningful learning experience, and are open supporting us in our learning. We all worked very hard to get the proposal submitted on time, given that we only had two days after our meeting to work it out, but alas! We submitted our proposal on time! We also sent a copy to our community partner to review and to assure that what we agreed upon is well-communicated. They have since provided brief feedback we have reviewed as a group and will incorporate moving forward. By this time, almost our whole group has had a chance to volunteer at the DTES NH. We think this has been really helpful in connecting with the NH and understanding their work, why they do it and who they do it for. We believe that the more we get to know the DTES NH, and its patrons, the more effective and accurate our project will be. Additionally, having the opportunity to personally interact with the DTES NH patrons, and hear from them directly about its impact, has given us more motivation and added even more purpose to our partnership with the DTES NH. At the same time as we were working on or proposal, we made a rough timeline so we could use the ‘divide and conquer’ strategy for our tasks, as reccomended by our community partner. Currently, we have split our group into two teams and separated our work, as TEAM 1 members: Rong, Shengjie & Tianyi, and TEAM 2 members: Kayla, Kelly & Niisii. For week 6-7, each member took responsibility for one subsections’ achievement, so hopefully in this way we are set up better to achieve everything we’ve set out to do. Between week 6-7, Team 1’s first task will be to research the three Business Improvement Areas: Hastings Crossing, Strathcona, and Chinatown. The purpose of their research is to find out how they work and what services they provide. This will be done through internet research (primarily by looking at their website, and for any articles written about them). This research will be done with the purpose of finding out if and how the DTES NH could connect with the various BIA’s and develop a partnership. After conducting the research on the three BIA’s, Team 1 will contact the BIA’s. The intention will be to ask for advice and/or resources that may help the DTES NH’s success in sellingthe year-round baskets they produce. The BIAs may also have helpful suggestions on who to approach to assist in selling their year-round baskets. Since various businesses who are members of these BIAs have products that are included in the DTES NH’s Holiday basket, any assistance the BIAs have can benefit both the DTES NH and other local businesses. Team 2 which will be comprised of the remaining group members, Niisii, Kelly and Kayla, who will be researching other organizations which the DTES NH identified as potentially being able to buy or distribute the year-round baskets created at the Neighbourhood House. According to the DTES NH staff, the University Neighbourhoods Association, Woodward’s Market, and Tapestry Senior Living Wesbrook have shown previous interest in the DTES and the work that takes place there, so they may potentially be interested in developing a partnership with the DTES NH. They will be doing this over the same timeline as Team 1, week 6-7. The research will primarily be done by internet research on their website and looking for any online articles. 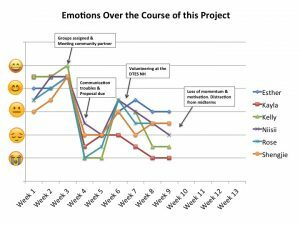 Following this research, between week 7-8, Team 2 will contact the three community organizations, the University Neighbourhoods Association, Woodward’s Market, and Tapestry Senior Living Wesbrook. As aforementioned, the staff of the DTES NH believe that these organizations will be able to offer useful connections and potentially will be able to provide avenues for selling their year-round basket. Team 2 will also be looking to provide resources to these organizations about the DTES NH (who they are, what they do etc.) to further potential partnerships. Although we are a group of students that grew up from other parts of the province, country and world, that did not prevent us from hearing about one of Canada’s most notorious areas – The Downtown Eastside of Vancouver. However, the introduction into the DTES and meeting our community partner for the first time, we realized that hidden behind the ‘scary’ exterior, there lies a strong and resilient community. It is so easy to judge anything when you only look at the surface without digging deeper. This can be said of the DTES, so we were very glad to be given an orientation to the neighbourhood before starting our projects. We learned a lot about the area’s diversity and rich history, which we found very useful; although, duly noted was the lacked the inclusion of the pre-colonial, Indigenous history of the DTES. This is important to note because the DTES lies on the unceded, ancestral land of the Coast Salish people, and it would be impossible to fully comprehend and work justly with the community, without this understanding or acknowledgement. The readings, the TED talk and the video of DTES residents advising UBC students on how to do research left us in a position to enter this work humbly and open to what we can learn from the community, rather than interacting in a patronizing way. Ernesto Sirolli’s TED Talk illustrated a very important lesson; don’t enter a place thinking you are the expert and tell the local people what to do, instead, “Shut up and Listen”. Being respectful and actively listening to community experts in important to integrate into our project because they are the ones who have a very clear idea of what will and will not work. 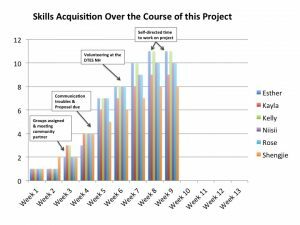 We found the article on Asset- Based Community Development (ABCD) to be a very interesting and promising approach, and collaborating with the DTES to put this theory into practice seemed like a great opportunity. It makes sense to use ABCD in the DTES because it emphasizes the importance of the pre-existing assets, skills, desires and energy and how they can be built on and used for problem solving and generating solutions. In the presentation at the UBC Learning exchange, the virtues of the DTES were quickly emphasized and included: the cultural diversity, the creativity, the strong history and the enthusiasm of community members among others. This framing would be drastically different than focusing on the reputation it holds as being an unsafe, drug-ridden part of town with many homeless and mentally-unstable people, which would align with the more traditional needs-based approach of development. We also found it interesting to connect our project to the theory of food justice. The DTES NH works actively to create a more food-just reality for DTES residents. The gift basket that our project focuses on uses local food products (some even produced in the NH by its patrons), which reinforces the values of locally-grown products and respect for the people growing and producing them. The in-house production of food products also helps contribute to a sustainable local economy. However, as we are learning, food justice in the real world looks very different from the textbook definition. As the DTES NH is a non-for-profit, constraints and barriers are a reality. Our community partner vocalized how some of the food products in the basket contradict their food charter (high sugar, processed foods, etc. ), and that, in an ideal world, this would eventually change, but for now, this is a reality for the NH as they move in a direction towards food justice. So after just one meeting, we are already seeing the difficulties in trying to achieve food justice without sufficient resources, but also how an organization such as the DTES NH perseveres despite the obstacles. After meeting with the Executive Director of the DTES NH, and listening to the number of things that could be done, we feel that there are a lot of small ways we can contribute to the work they are doing. There are also some bigger, more challenging tasks that may require skills and knowledge that are beyond our areas of expertise. This left our group feeling concerned about how we will be able to best support the DTES NH; what kind of tangible result will we be able to deliver at the end of just two short months? However, despite these doubts, we feel that as long as we are focused and systematic with what ideas we tackle first, we will be able to provide some helpful resources to their organization, though we acknowledge that we might not be able to complete everything on her list. Additionally, the Executive Director will be on leave this fall, so she will not be working with us consistently through to the end of the project. Naturally, this has made us feel somewhat concerned about the effect this will have on our success. We are also curious to see exactly how this project will connect to food justice since we will be working more from a product development and marketing approach. Although we have some concerns about this project, we believe that they illustrate our deep investment in its success, and reflect the natural uncertainty that comes with leaving the classroom and working in a real-world environment. We are all very eager to learn more about ABCD, food justice, and the DTES while working alongside a local non-for-profit. We hope that as we jump into the project in various ways, it will become clear what we can do to amplify the DTES NH’s positive impact. We will be working with the Downtown Eastside Neighbourhood House (DTES NH), an organization situated in a welcoming space in the DTES core, providing inclusive programming and a wide range of social, educational, and recreational opportunities to the diverse residents of Vancouver’s Downtown Eastside community. Our project will help support one of the many initiatives of the DTESNH: The Holiday Gift Basket. This initiative not only is a creative fundraising project, but also provides employment opportunities for local Downtown Eastside Residences and supports community-based economic development in the neighbourhood. This will be done by exploring new partnerships with local businesses, social enterprise organizations and markets, in addition to producing a strategy for expanding DTES NH’s marketing program to reach new audiences.